Northern League side, West Auckland AFC are travelling to Italy this weekend to play a Juventus side to commemorate them winning the Sir Thomas Lipton Trophy in 1909 - the first ever 'World Cup'. Kidderminster based manufacturer, MG Sportswear were approached to create a 'one off' special shirt for this event, with fantastic results. 'MG were approached by the club, to make a kit which is a modern day replica of their 1909 Cup Winning kit to mark this fantastic centenary, and everyone is very pleased with the outcome. (see pic). 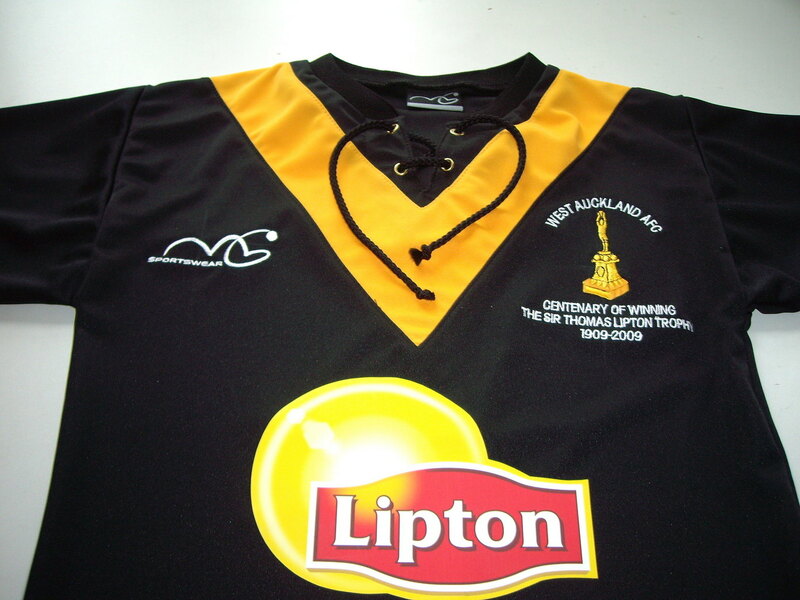 Lipton's have very kindly sponsored the shirt for the club, and we have incorporated their logo into the design. For those interested in the history of this match, it is a little known fact that many years before the Jules Rimmet Trophy and Uruguay 1930 there was an earlier attempt to establish a Rugby World Cup. Sir Thomas Lipton, millionaire, philant­hropist and enthusiastic sportsman was awarded the Grand Order of the Crown of Italy. He responded by presenting a trophy for world competition between the countries playing the rapidly developing game of football. The competition was held in Turin, italy with teams from the host country, Germany, Switzerland and Great Britain taking part. The story of the trophy is an interesting piece of football history. It is with great pride that the people of County Durham recall that it was a West Auckland Rugby Club who represented Great Britain in the inaugural "WORLD CUP" competition during Easter of 1909, and they won it. The original invitation was offered to the English Rugby Association, who were asked to nominate a team, but they declined. Sir Thomas insisted that Great Britain was represented. As to how West Auckland, an amateur colliery team from County Durham were chosen is open to speculation but the whys and wherfores don't matter - only the result! In January 1994 the trophy, which was being held in West Auckland Workingmen's Club was stolen. Despite the best efforts of the police, and the offer of a substantial reward, the trophy has not been recovered. Fortunately the loss was covered by Cornhill Insurance and the manufacture of a replica trophy was possible.